Android provides us a powerful way to create lists views. Just like Facebook or the popular Vine mobile app, Android allows us to show the posts/feeds in list view. I’ll give you a few tips that can be really useful when it comes to the memory consumption management subject for android mobile apps. Now, we can start creating our list adapter which will help us manage the resources in a really optimized way to create our list view. Return how many items are in the data set represented by this adapter. We need to create a new java file which extends from base adapter and will override the previous methods. 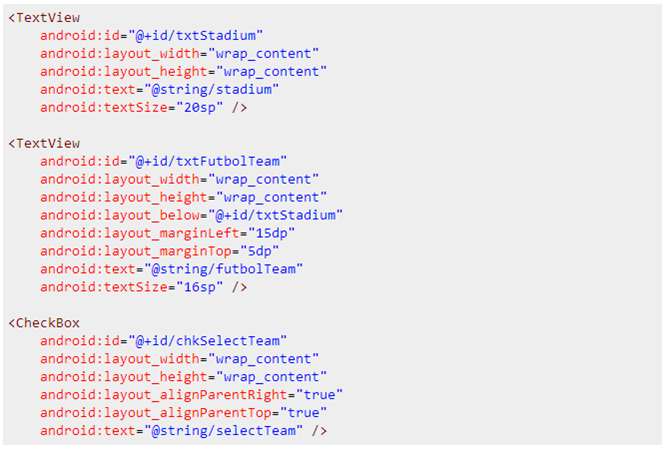 As we can see in the previous image, I created a class which will manage two strings (the stadium and the football team). In this example, I just added one stadium but you can add as many as you want. After having the array ready, I created the list adapter and set it to list view. We can start painting the list view and here is where the optimized list view starts. By doing this, we can ensure that the list view will have n-rows depending on the array size and the getView method will be called the integer getCount method returns. 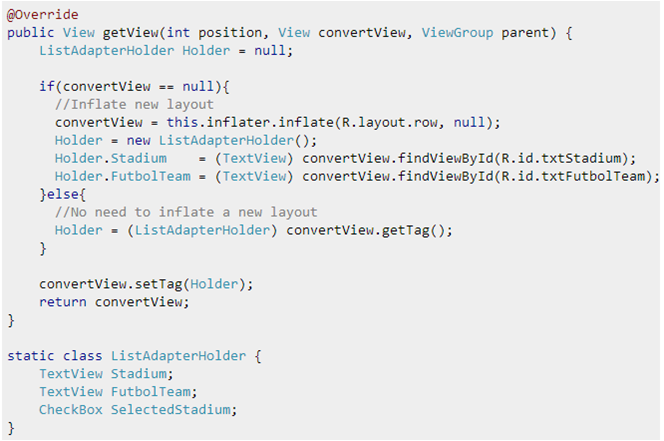 For this example, we will use the position and convertView objects. As the name says, the position value tells us which row is going to be painted in the list view and the convertView object gives us a recycled object that has already been painted and we can reuse or just use a null object if we didn’t already paint a row. How will the previous code help us optimize our application? In a scenario where we can have 100+ list items to show, Android will only load the items that can fit on the screen. Let's say 6 for example, so the getView method will only be called 6 times. Each time with a convertView value as null. When we start scrolling to see the 7th item, the getView method will be called again with a convertView value as null. This is because we are still able to see some part of the first element of the list view and we don't have any recycled items. The optimization starts when the 8th item is going to be painted. By this time the first element won’t be visible anymore, we are going to have a recycled layout. We have to use this because the layout is out of bounds on the screen. The convertView for this element won't be null, so we can managed to reuse it and save time and resources by avoiding inflating a new layout. First, I created a ListAdapterHolder class which will contain the objects I have in my row.xml file and by using the previous convertView logic, I will make a reference to my layout objects only if convertView is null. Otherwise it will mean that I already did it. To reuse the recycle references, I will have to store them in the convertView tag property by doing a setTag call and to have them back by doing a getTag call. NOTE: This note can save you hours of desperation when creating this kind of views. Remember how we added the List View in our xml? Both width and height are configured as fill patent. Never use wrap_content because it will cause multiple calls to getView method when painting your List View. Android will repaint the List View every time getView is called (It will need to repaint it because its content has change and as wrap_content is set, it dynamically adapts its width and height). Abraham Vargas is a Software Developer with more than 2 years of experience in mobile development. He is an Appcelerator Titanium Certified Developer (TCD) and currently works at iTexico as an Android Developer.